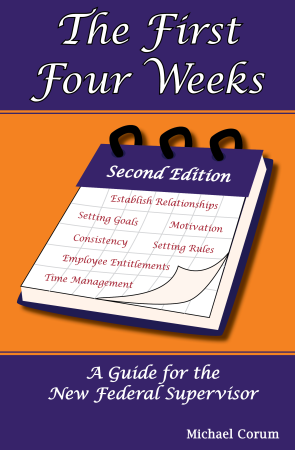 The First Four Weeks: A Guide for the New Federal Supervisor offers guidance for the newly promoted or selected federal supervisor through the most important time in his or her new job�the first four weeks. Written by one of America�s leading authors of books on supervision in the federal civil, the book guides new supervisors on how to determine priorities, create the right structure, negotiate performance expectations, set the right tone, and establish credibility with both higher management and subordinates. Also included are a detailed table of contents.